Can you believe it will be June tomorrow, craziness right? 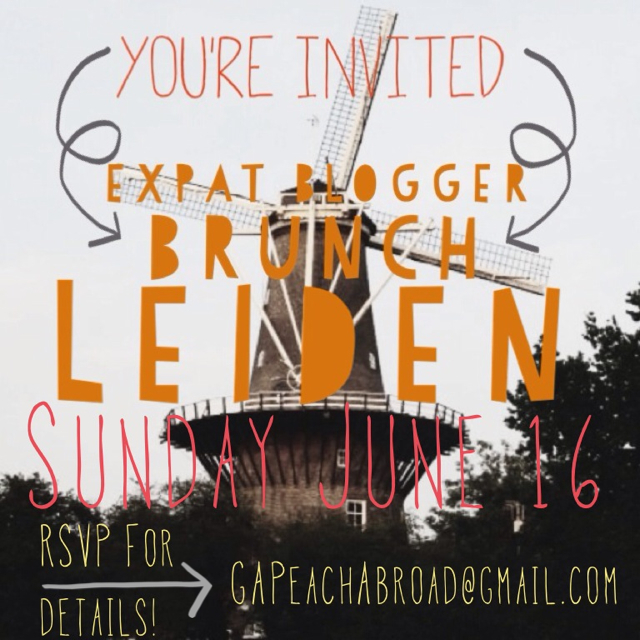 I wanted to let you guys know that the June Edition of the Expat Blogger Brunch will be held in Leiden on June 16th. Lily and I look forward to these brunches so much each month and can not wait to see you guys there! If you want to attend please RSVP by June 14th to GAPeachAbroad@gmail.com. We try to keep the number around 15. Can't wait to connect/reconnect with you guys! Hope to see you there or at the one in July! Yesterday I promised that I would introduce you to the lovely ladies of our May's expat brunch.Some of these ladies you have met before, some are going to be new. Go follow them, I love them all. I especially love that unlike some other groups I have been apart of, this group has yet to turn into a negative complaining place. I want it to stay this way forever. First up is my co-host, Lily of Lily Wanderlust. I feel like all my crazy stories here in the Netherlands have her in a co-starring role. We are trouble when we get together. But the best kind of trouble. Go forth and read about my bestie. Amanda of Poppies and Ice Cream is just one of the sweetest girls on the planet. She is also incredibly smart, as someone who has never been particularly good at science, I am in awe over her scientific knowledge. And she is an awesome baker, which is the key to my heart. Gaby of Holland Daze is my sunny ray of California sunshine. She is just so warm and caring. She is one of the first expats I met here and I am so glad that we are still friends! Somehow I never get to talk to her as much as I want. We need to fix this Gaby! Emily of Dutch Tales is a Southern girl like me. I am uber impressed by how much she has been able to do in just her few short months of being here. She's bought a car and learned how to drive a stick shift. And, she landed a job that can actually turn into a career, virtually unheard of for an expat here because she married a Dutch guy! I'm also excited because we have discovered she lives even closer to me than we thought! Shoshannah of Awesome Amsterdam is one of those people who can make friends anywhere she goes. Her blog highlights some of the awesome places and things to do in Amsterdam. There are so many cool things to discover on her blog. Mary of Pick the Wild Card is Scottish and a teaching assistant. Sadly, she is leaving the Netherlands for Germany, but with a stopover back in Scotland for a bit. She is a very sweet girl and you should take the time to read about her adventures. Christa of the daily pin is an awesome lady and mother who lives in Eindhoven. I love that we have some mom's in the group to answer all of our burning questions about raising a family abroad if/when the rest of us reach that phase in our lives. You can also find her here. Candi of Candiland is a recent transplant to the North near Groningen, which lamely I still haven't been to. Candi is awesome and so fun and crafty. Maybe one day I can even get her to teach me how to sew, which I have been wanting to learn for years. Go check out her fun blog. There you are, some of my favorite ladies who call the same rich country that is the size of Maryland that I do. Go check them out! Who are your favorite expat bloggers? 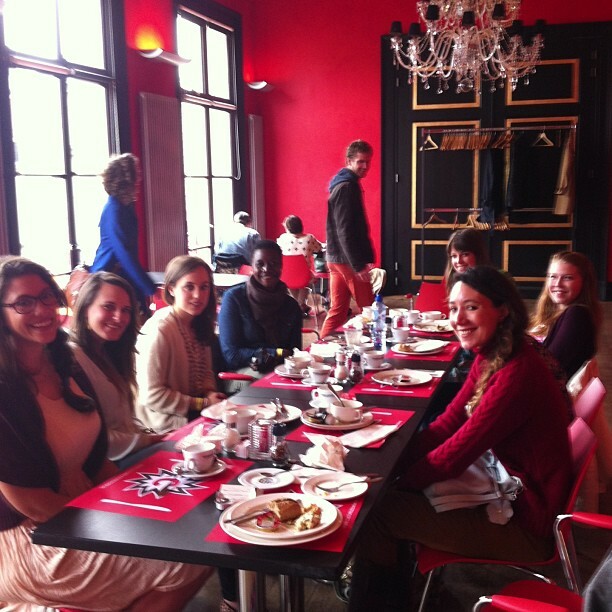 Our second expat brunch took place last Sunday. I look forward to these brunches all month long. For me, it is a much needed girl's day in a hectic, hectic schedule. What I love the most is the fact that I have a standing date to reconnect with old friends and to meet some great new ladies. I am amazed that so far everyone has meshed so seamlessly together. It is truly a highlight in my life each month. This time, we all met in Amsterdam and had brunch at the cute Le Pain Quotidien. I had an amazing Goat Cheese Tartine and they serve their coffee in bowls. Personally, I think every place should do so. After brunch, we went out for a few beers before the ladies started heading home. 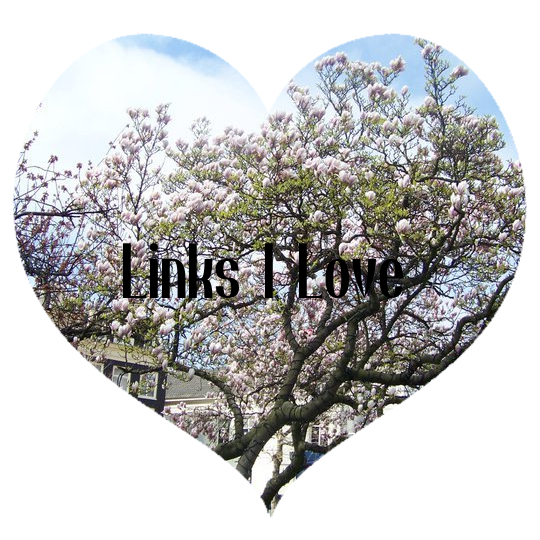 Tomorrow's Links I Love will introduce you to the ladies who attended, you are going to love them! After everyone left, Lily and I had an adventure on her Dutchman's boat, but that is such a long story it deserves its own post. Finally, we met back up with one of the girl's from brunch for the IAMEXPAT party and dinner at Va pianos. Va pianos is by far my favorite pizza place in the Netherlands, too bad they don't have them in Utrecht! 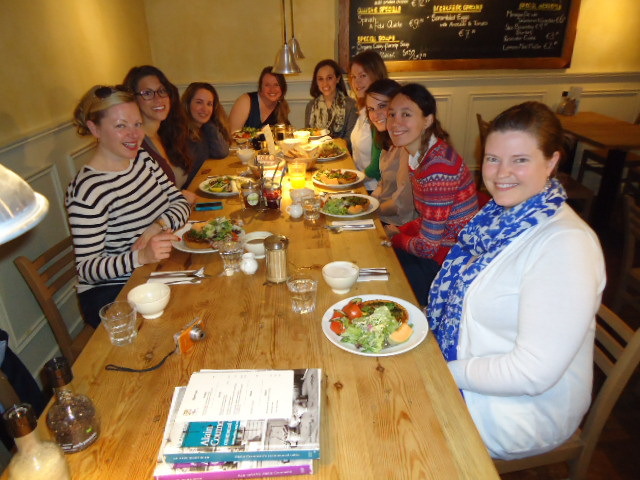 Yesterday it was finally time for our Expat Blogger Brunch. Honestly, we could not have planned a better day weather wise. In the end, there were 9 of us girls. It was a great brunch, okay maybe the food could have been a bit better, but the conversations and fellowships that developed were right on par with what Lily and I were hoping. Sometimes it is just so great to be surrounded with other people that you can relate to in a city that you love. After brunch, a smaller group of us went for a walk around the city. The sun was shining, there were dance events and it is the 300th anniversary of the Peach of Utrecht. We wandered around the city in the sunshine. Don't let that coat in the picture up there fool you, it was soon time that I regretted the fact that I had any sleeves on at all. Which for those of you who don't live or visit the Netherlands often, you can't realize how big of a deal this is in the rainy often cold country I call home. The day ended at least for me, with drinks at the Louis Hartlooper Complex. I had the Maximus Brutus beer from a local brewery here in Utrecht that I didn't even know existed. Turns out, it is actually right by my house, anyone down for a brewery tour? To the ladies who came, thank you so much! You made my Sunday awesome and I hope you also had a great time. For those of you who couldn't make it, Lily and I have already started planning for next month, we will keep you posted with more info when we have it. Check back in on Friday where I will have my first ever link up and share the blogs of our April attendees.